Intensive driving courses are the best way to pass your driving test in Brighton and Hove. There are a number of reasons why you should do an intensive driving course, the intensive driving courses are the most efficient, quickest, successful and therefore the cheapest way to pass the driving test. 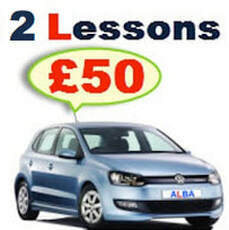 If you need to pass your driving test quickly for instance because of work or the need to fit it into college or maybe your international licence is running out soon or you've had your licence revoked then this is best ideal to pass driving test. Our intensive driving courses are designed to be very flexible for learners who need single week or multi-weekends course. Thank you so much Blenti for helping me to pass my driving test first time within two weeks from scratch, unbelievable! You made me feel safe on the road and confident passing my driving test first time amazing! I would highly recommend anyone learning to drive with ALBA.